Each month we host a Graphic Novel Book Club meeting, open to all, during which we hang out and informally discuss a featured graphic novel. 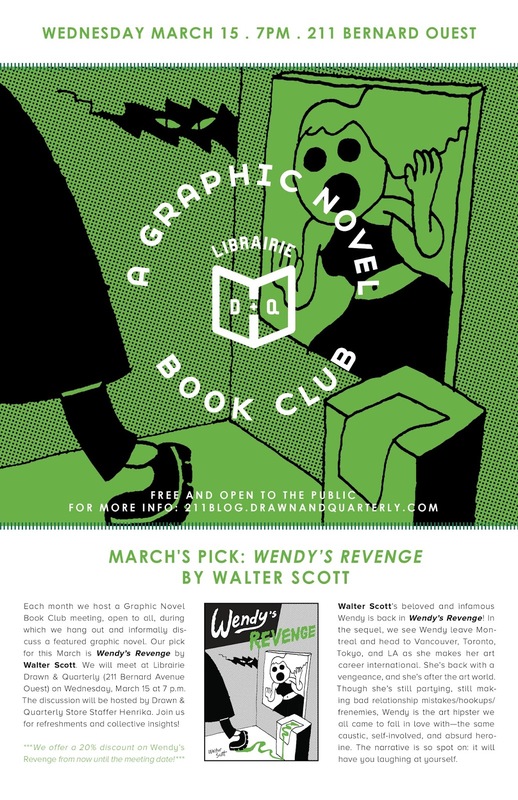 Our pick for this March is Wendy's Revenge by Walter Scott. We will meet at Librairie Drawn & Quarterly (211 Bernard Avenue West) on Wednesday, March 15th at 7 p.m. The discussion will be hosted by Store Staffer Henrika. Join us for refreshments and collective insights! Walter Scott's beloved and infamous Wendy is back in Wendy's Revenge! In the sequel, we see Wendy leave Montreal and head to Vancouver,Toronto, Tokyo, and L.A as she makes her art career international.She's back with a vengeance, and she's after the art world. Though she's still partying, still making bad relationship mistakes/hookups/frenemies, Wendy is the art hipster we all came to fall in love with - the same caustic, self-involved, and absurd heroine. The narrative is so spot on, it will have you laughing at yourself.